For the first time in a very long time the Yankees are considered to have one of, if not the, top farm systems in all of baseball. In 2015 we saw a new strategy from the Yankees, who hit the reset button and traded a handful of big name vets for blue-chip prospects. This was a long time coming for the Yankees. It was only a matter of time before their aging core of homegrown talent retired and their hefty free agent signings of the mid-to-late 2000’s went downhill. But rebuilding a Major league farm system is not an easy task. MLB is not equivalent to the NFL, NBA, or even the NHL. Bryce Harper was the first prospect I ever remember being labeled a “sure thing.” Lebron James type, straight from high school to the big league players don’t exist. On top of that, it can take years to know if your picks are a bust or on a path to the big leagues. Unlike the NFL, where you can screw up a pick today and come back strong the next year, your pay off in the Major Leagues takes time. All these factors contribute to the difficulty of cultivating a rich farm system and developing young stars that can contribute at the Major leave level. Getting younger isn’t a choice; it’s a necessity if you want to build a long-term winner. Without homegrown talent your payroll will be astronomical, because the only way to obtain top tier talent is to shell out huge contracts. As the Yanks seem to be sticking to their plan of being more frugal, this is no longer an option. Also, we see what happens in the backend of those mega contracts. You will eventually have to pay the prospects, but at least you’ll be getting a guy going into his prime who is used to his environment and team culture. With this all being said, let’s be realistic about each one of the top prospects. It’s important not to overvalue a prospect and their abilities. With every Derek Jeter there are 10 Eric Duncans. So when we hear trade rumors for a legitimate, proven MLB star requiring top prospects, we must be careful to not quickly dismiss it. I wanted to map out the scouts grades and ceiling/floor player comparisons of the Yankees top prospects. Putting this into perspective will help us visualize the risk & reward of holding onto these guys or dealing them for other talent. Note: The official 2017 prospect rankings aren’t out, so these are based on my knowledge, Baseball America, MLB’s 2016 rankings, and Baseball Prospectus. Also, I’m trying to be realistic with their major league comparisons, but for the record I hope each prospect is 10x better than their ceiling comparison. Lastly, the comps relate to their future major league production. I’m not so much comparing swings, mechanics, etc. A level – Elite blue chip prospects. Greatest opportunity to not only make the major leagues, but be successful at a higher than above average level. B level – Highly skilled prospect, but not quite elite. Great opportunity to enjoy successful major league careers as average or at least rotational players. C level – Possess high level or even blue chip skills, but also have multiple question marks or developmental road blocks. By all accounts Torres will be a successful major leaguer barring injury. It’s pretty solid when your floor comp is a former outfielder. The question is, just how good could he be. Gleyber’s most impressive trait is his mature plate discipline. His ability to work counts and get on base is extremely rare for a player his age. He is above average in contact, power, speed, and defense. Interestingly enough, some prospects think he may struggle to develop as a defender, but others think he can be a gold glove shortstop. His defensive technique mixed with his athletic ability lead me to be it’ll trend more toward the latter. He has above average speed but his base stealing technique needs work, which is certainly not a red flag. Again, his difficulty will be to put it all together. Can he successfully hit for power, while being a plus defender and semi- speedster? The tools and maturity are certainly all there. Tons of people have likened Frazier to Josh Donaldson or even Mike Trout. I’m not currently buying those comparisons. Frazier is a physical beast; just take a look at his social media this off-season, and he also has elite bat speed that cannot be taught. But he has a bit of a hitch in his swing, which needs to be worked out if he wants to cut down on his strikeouts and hit breaking pitches at the Major League level. This hitch may deprive him of the monster power that his physical appearance suggests he’s capable of. But, like Abreu he has impressive bat control that allows him to hit to all fields and put the head of the bat seemingly wherever he wants it. Defensively, his arm is above average but his route to balls must improve. There is no reason he can’t settle into a corner outfield spot and be a solid defender. His speed is good, not great and it wont get any better as he gets bigger and stronger. His best asset on the bath paths is his first to third speed. He certainly is a gamer who is confident in himself and his abilities. It will be interesting to see how he handles adversity as he approaches the move to the Majors. 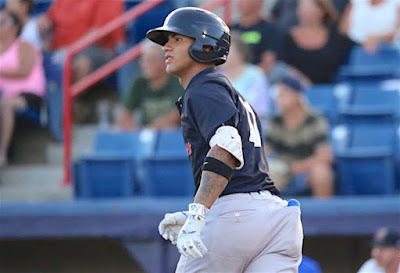 Many projected Rutherford as the best bat in the 2016 draft, but signability issues scared many teams away allowing the Yanks to steal him with the 18th pick. Scouts see him as a 5-tool prospect, with only his arm a bit in question. Rutherford has impressed thus far pulling in an overall .351 in a season or so in the minors. His average arm strength will probably push him out of Centerfield into a corner outfield spot. He hasn’t flashed the power many think he is capable of, but his contact rate is tremendous and he has shown a great ability to get on base. He is extremely athletic and his body has room to get stronger and faster. His maturity is high and he is known to be a student of the game. If he properly develops he has the chance to be a .300/20+ HR guy. Jose Reyes is thrown around a lot as a comparable ceiling for Mateo. If you break down his swing, that doesn’t make too much sense, because at this stage of the game it’s a bit long which doesn’t translate to a high OBP guy like Reyes. This will also make it difficult for him to be a leadoff hitter. His speed is deadly but based on his current approach I’d project him best case in a two-hole spot or at the bottom of the lineup to turn it over. Of all the prospects, Mateo may be the hardest to project because of how raw he is. He is the definition of boom or bust depending on how he develops. Defensively his speed allows him to get to balls others couldn’t even dream of. But like everything else, his technique is lacking. At the plate he has great power for his size, but again he has a bit of a long swing and overly aggressive approach. If he can bring his contact rate up he could be a huge success because of his game changing speed. He has already proven he can hit to all fields, now like most prospects, he needs to cut down the strikeouts and work on his walk rate. Listed at a generous 5’10, Sheffield is undersized, but his motion is fluent and effortless. His fastball regularly sits in the mid-nineties through out his starts. He has excellent movement on his fastball and normally can locate extremely well. A slider and a changeup make up his 3-pitch repertoire. His slider is a plus pitch that he keeps low in the zone. The development of his change-up is what has the Yankees most excited and moved Sheffield away from a relief projection, to a possible front-end starter. Fine tuning his mechanics, staying healthy, and working on his change-up command will be Sheffield’s keys to success.